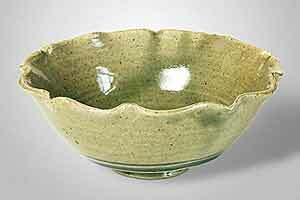 Seth Cardew celadon bowl - 6¼" (158 mm) diameter, 2¾" (69 mm) high. Seth Cardew was born in 1934 despite his youthful looks, which might be due to following his father's habit of taking an early morning dip in the river, summer and winter. After studying art and sculpture at the Chelsea School of Art and the Camberwell School of Art he spent fourteen years in the film industry making clay sets for studios at Borehamwood, Pinewood and Elstree. Sets for the multi-award-winning film Cleopatra are among his credits. In 1971 he he joined his father, Michael Cardew, at Wenford Bridge and started potting in earnest in 1974. On his father's death in 1983, by which time he had established himself as an important potter in his own right, he took over Wenford Bridge. He has made radical changes to the layout of the pottery to improve efficiency - notably the arrangement of the work stages in a horseshoe shape so that the work flows naturally from the point where the raw materials are delivered, through the clay preparation stages, blungeing, watering, cleaning, de-watering, to the workshop, drying racks and finally the kiln. The final alteration, which remained unmade, was to modify the stoke holes of the large double-chamber downdraught kiln. They were designed to suit his father who was left-handed, and Seth is right-handed. Seth has undertaken lecture tours throughout the English-speaking world since 1983. 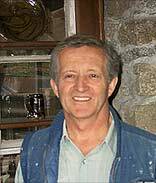 His wife, Roberta, helped him at the pottery where courses were arranged for student potters. Seth and Roberta moved to Spain in 2004. Michael Cardew moved from Winchcombe to Wenford Bridge on the edge of Bodmin Moor in Cornwall with his wife, Mariel, and his three young sons in June 1939. 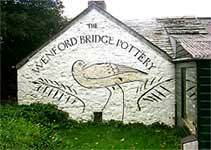 They bought the derelict Wenford Inn for £500 and started to convert it for use as a pottery. Before the conversion was finished, war broke out, and after only two glaze firings at Wenford Cardew had to return to Winchcombe to help Ray Finch who had been badly affected by the conscription of both Charlie and Sid Tustin. He stayed there until June 1942. While he was at Winchcombe he was offered the position of Pottery Instructor at Achimota on the African Gold Coast. Money was tight and the £600 per annum that the job offered was too good to refuse. Cardew was to remain in Africa for the next six years, with only a brief return to England during the winter of 1944/1945. In 1948 trouble was brewing in West Africa and Cardew's life was threatened. He returned to his wife, family and home in July of that year. He worked as a thrower in Surrey for six months and then resumed work at Wenford Bridge. In 1950 Ivan McMeekin, an Australian potter joined as a partner, and ran the pottery when Cardew returned yet again to West Africa. McMeekin build a down-draught kiln and produced stoneware at Wenford Bridge until 1954. Cardew spent two months of each year at Wenford Bridge during his fifteen year stay in Nigeria, but after McMeekin returned to Australia the pottery was unused until Cardew's retirement from his African post in 1965. Cardew then potted at Wenford Bridge when lecture tours and demonstrations permitted until his death in 1983. In 1971 he was joined by his eldest son, Seth Cardew, and in the following years many fine potters including Svend Bayer, Michael OBrien and Danlami Aliyu spent time there as students.